Technical debt is acquired when you take shortcuts while developing your software. It helps you get the changes in place faster, but it results in code that is harder to understand. Ward Cunningham coined this term while he was working in a financial institution to explain why they were refactoring. His boss at the time was a financial guy, and this was financial software, so a financial metaphor was the best way to explain this principle. When you want to buy a car, and you don’t have the money, there are basically two things you can do. You can wait and save until you do have the money to buy the car, or you can borrow it. Translating this to writing code, you can implement the feature correctly, with clean and clear design. This way, when it needs to change, it is easy to understand and changing it will be faster. Or, you can do it the quick and dirty way. This is faster, for now. But when the time comes to change the code, it will take more time. The two components of financial debt also apply to technical debt. There is interest, and there is principle. We pay interest when we need to change dirty code, and we pay down the principle when we clean that code up. Here are a few things to help get technical debt under control. Choose good names for your functions and variables, and rename to better names when your understanding of the code changes. You are not just telling the computer what to do. You are also writing a document for future developers. You are creating a language in which to communicate your thoughts about the problem at hand. This language is a mixture of reserved words of the programming language (for, if), terms that are used in the domain (account, customer), and terms that are common in our industry, such as design patterns (action, command, listener). The easy part is getting the computer to do what we want it to do. The hard part is telling our future selves what we are thinking. Longer methods tend to do more than they should. Splitting methods into smaller methods makes them more readable, manageable, and reusable. Another advantage of smaller methods is that you get lots of them, and that makes it easier to group them in the correct classes. While the production sourcecode is the primary document we deliver, there is another document: unittests. When written correctly, unittests are quite helpful in further explaining the code. They will tell how objects are created and used. This is one of the reasons Test Driven Development is useful. They are also quite useful for spotting design flaws. For example, when you find an uncovered private method, and it’s just too hard to reach it through the public interface of the class, chances are that the class has too many responsibilities and should be split into multiple classes. With shorter methods comes a more fragmented codebase: functionality is split into more fragments. This usually means that duplications become more visible. The duplications are already in the code, but sometimes they are hidden. Duplications are generally considered bad, because it usually means that you need to apply the same change to multiple pieces of code. And that’s easy to forget. According to Kent Beck, eliminating duplications is a powerful way of getting a good design. What does the class do? What reasons does it have to change? How many responsibilities does it have? A class should have only one role, only one responsibility. For example, it should only validate input, or format some text. Some ways of finding the responsibilities of a class include grouping of method names and drawing the relations of the class members. Responsibilities can live on the interface level, and on the implementation level. Classes can either delegate the responsibility to other classes, or they can implement the responsibility themselves. When a class implements too many responsibilities, it’s easier to move just the implementations those responsibilities to other classes, and keep the original methods. These methods then act as a gateway to the new classes. Over time, we can modify the system so it only uses the new classes, and then we can remove the gateway methods. TDD is the ultimate agile practice. You can’t get faster feedback cycles than with TDD: often a cycle lasts well under a minute. Because of this, you always know that you’re moving to the target. However, I’ve met very few people who know about TDD, and even fewer who actually practice it. I was at a technical meeting a couple of months ago, where the presenter asked the question who knew about Test driven development. Out of about 50 developers who were present, only about 10 raised their hands. The question who had experience with it managed to raise only three or four hands. But it’s even worse than that. I’ve worked on quite a few projects, and most of them had a limited set of unittests. The project that I’m working on now only has about 42% coverage, and a good deal of code is covered by useless or unreadable tests. Useless, because the tests don’t actually check the behavior. Unreadable, because of duplications, long setups and multiple asserts per test. As an industry we know that unittests are important to catch bugs early on. But unittests are often written after the production code, and that’s boring and complicated. So, often it is skipped altogether. Writing unittests before writing production code, or actually, alternating between writing tests and production code, would help. Red: Write a test to specify the behavior. This test will fail because the behavior doesn’t exist yet, resulting in a red bar. Green: Write the behavior specified by the test. Get it working as soon as possible, it is OK to make a mess. Refactor: Eliminate duplications. Both from the production code and from the tests. This last point is important, because the tests need to be readable to be useful. When you follow this sequence over and over again, you’ll start to notice that the code you produce is quite nice to read, and well factored. The code will tell you how it wants to be designed: design emerges, instead of being imposed on the code. Fixing bugs is also faster with TDD. Once you’ve located the problem, write a test to verify that problem. Then adjust the test so it will verify the correct behavior. At that point you don’t need to go through the compile/deploy/test cycle again. You just run the unittest to see if you’re making progress. Then, when you fixed the behavior according to the test, you can always test it manually. The biggest downside of TDD is that it is hard to learn. Perhaps this is the reason why it is not practiced as much as it should. It is a mindset, a habit that needs to be formed. It will take months to get good enough. Therefore, it is recommended to practice on a side-project, or at least practice on small, clearly defined pieces of behavior. But once you do use TDD, you will be a better developer. In this post, we will make a (very) simple CRUD application using Maven, Hibernate, PrimeFaces and Jetty. It won’t be the best application out there, but enough to get started. Run ‘mvn jetty:run’ to start the application. Click here to download the actual project. Of course there needs to be a database schema to store the records in. We will use a MySQL database for this. For simplicity, all keys are bigints, and all other fields will be varchars. 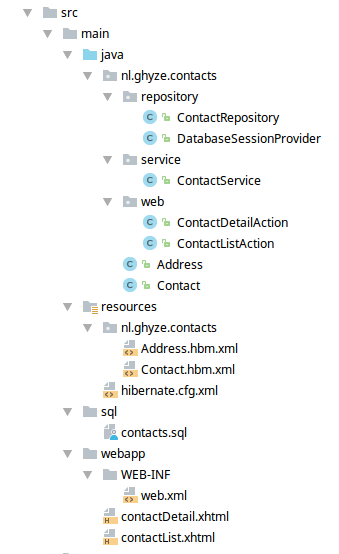 Now we will need to tell Hibernate how to map the database tables to objects. These days you’ll probably use annotations for that, but to keep database-related code out of our entities, we’re going for XML configuration. Now we need to configure hibernate, telling it how to connect to our database and which mapping files to use. Next step, setting up the connection from our application. Since we want only one place to manage the database connectivity in the application, this will be set up as a Singleton. At this point we’re ready to read, write and delete contacts from and to the database. We’re going to use HQL for this purpose. With the database stuff out of the way, let’s create a simple service for communicating with the repository. At this point we’re getting into PrimeFaces. We’re making this a ManagedBean, so it can be injected into the Action classes that we’ll discuss next. Before we continue, let’s take a moment to think about the front-end of the application. We’re going to make two pages: the first one listing all the contacts that we have, and the second one listing the details of one single contact. Each page will have its own backing class, handling the server side actions of the requests. The list action will be simple: it only needs to provide a list of Contacts that is currently in our database. The methods that receive an ActionEvent as parameter are called from PrimeFaces. Pay attention to the method signature, as this is something that lots of developers struggle with. Now we’re ready to create the .xhtml pages. For the list, we’re going to create a table for listing all contacts. The last column will have buttons, so we can edit the contact in that row. Clicking this button will navigate to the details page, supplying the ID of the contact. Below the table there will be a button for adding new contacts. The details page is, again, a bit more complicated. This page receives the contactId, and sets it in the action. This part is a bit confusing, and it takes a while to understand. The f:metadata tag is responsible for this. The p:commandButton tags are used to call methods in ContactDetailsAction. This is how those methods that take the ActionEvent parameters are called. The Deployment Descriptor (web.xml) tells the application server how to handle incomming requests. The maven project configuration (pom.xml) tells maven how to build this project. It contains all the dependencies. Pay attention to the last part of the configuration, the maven-jetty-plugin. This is how we start, and test, the application. Intuitively it makes sense to group several statements in an if/else clause. In that case you only need to execute the check once. However, this is not always the cleanest solution, and it makes methods longer than they should be. For example, take the following piece of code. So, what’s wrong with this? It does what it’s supposed to do, and it doesn’t look too complicated. First, copy the condition, and move the statements around so that each condition handles only one property of the document. This doesn’t compile, because documentType isn’t available in the second block. So, let’s move the declaration of DocumentType outside of the first block. Ah, that’s better. But there’s duplication: document.setType is called on two lines. Let’s move that outside of the if block. And, while we’re at it, let’s do the same for setName. This is getting in better shape. Now we have separate logic for getting the DocumentType, setting the DocumentType, getting the name, and setting the name. Let’s extract some methods and see what happens. Our original method looks a lot simpler now. But the methods we’ve extraced contain duplication! The condition itself, the calls to repository.findByCode, and the calls to getDateAsString(). So, let’s fix that. This code still looks a bit odd. getDocumentType() determines the document type code, and then uses that to find the documentType. And getName() has a similar issue: it determines the prefix for the name, and then appends the date as String. At this point we have some variables and perhaps some methods that are not adding anything in terms of clarity. We should inline them and compact our code a little. This refactoring introduced a couple of new methods. Each method call takes a little extra time, and reduces performance a bit. But there’s a catch: with modern processors, cache-misses are the biggest performance killers. Keeping the data as local as possible will reduce cache-misses and increase performance. In practice, however, I doubt that you’ll even notice the performance difference. As for clarity, the original code expanded from 11 lines to 34 lines, a 3-fold increase. However, the original method decreased a bit. And because we’ve added a couple of layers of abstraction, the method now communicates only what it does. The details of how are delegated to other methods.